Under the patronage of HH Sheikh Hamdan Bin Rashid Al Maktoum, Deputy Ruler of Dubai, AUE Minister of Finance, and President of Dubai Health Authority, Abdullah Bin Souqat, Executive Director of Hamdan Medical Award, has launched the National Awareness Campaign on Rare Diseases under the slogan "Solidarity". The campaign was launched through the Ceremony, held yesterday at the stage of the Children's City, Creek Park in Dubai, and attended by children with Rare Diseases and their families. During the Ceremony, it was announced that the Campaign will start its activities at Mirdif City Centre and Mall of the Emirates, in Dubai, starting from Sunday, 26 February until Thursday, the first of March 2012. In his speech, Abdullah Bin Souqat sent the greetings of His Highness Sheikh Hamdan Bin Rashid Al Maktoum, and the members of the Award's Board of Trustees, wishing the campaign all success. 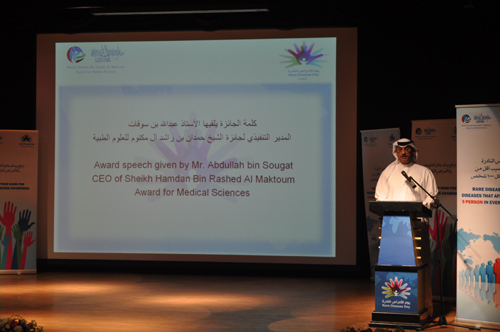 "It is the second year for the Award to celebrate the Rare Diseases Day, thus UAE has become a friend of the World Rare Diseases Day", Bin Souqat said. "Through the campaign, we wish to send a message to the workers in the health sectors concerning taking the children with Rare Diseases into account while putting the UAE future strategic plans", Bin Souqat added. In her speech, Dr. Fatima Bastaki Consultant Pediatrics and Clinical Genetics specialist, and head of the Campaign's Organizing Committee thanked Hamdan Medical Award for supporting the campaign. "This year's campaign aims at raising the awareness on Rare Diseases, to reduce the rates of incidence and support the families of the children with Rare Diseases", Dr. Fatma said. During the Ceremony, five stories of children with Rare Diseases have been presented. Their parents have called for establishing more schools and rehabilitation centers for children with special needs. Also, they have expressed their needs for doctors in all medical specialties, well prepared to deal with their children. Also, the parents have appealed to governmental and semi-governmental organizations and the society's members to support medical research on such diseases to put a limit for the long suffering of the children with Rare Disease. Concluding the Opening Ceremony, a march of motorcycles, bearing the slogan of Rare Diseases Day, kicked off at the gate of the children's city.